The Muskwa-Kechika Management Area (M-KMA) is 6.4 million hectares of wilderness located in the Northeastern corner of British Columbia. It is some of the most biodiverse wilderness left in North America, providing habitat for critical species like moose, grizzly bear and mountain caribou. The M-KMA was protected by British Columbia legislation adopted in 1998. The wilderness quality of the area is to be maintained in perpetuity, where human activities take place in harmony with diverse and abundant wildlife and ecosystems. The law has enabled ecotourism outfits like low impact horseback safaris to provide economic opportunities, ecological monitoring and advocacy which has staved off resource development. The M-KMA is managed by an advisory committee which represents diverse perspectives. The M-KMA is truly remote wilderness that has geographical barriers which make it hard for people to get in and out of the region. Bushplanes, jet boats and horseback are about the only options to enter the region. Due to the truly rugged nature of the M-KMA, survival skills and outdoor education are essential for safe travel. Along with geographical and ecological challenges, there are huge social and economic pressures from industry and surrounding communities to open up the M-KMA for exploitation of its resource-rich mountains and valleys. British Columbians, First Nations, threatened wildlife species, and visitors. 1. Conservation usually depends on grassroots movements led by people who care about the environment, which in turn puts pressure on industry or government to adopt protective policies. Such a grassroots movement spurred action in the M-KMA. The first building block was a media campaign used to communicate the cultural, spiritual and environmental value of the land as untouched wilderness. This campaign informed the public sphere because it is hard to advocate for something you don't know exists. As the campaign built momentum, pushing an audience of British Columbians into advocacy, this mounted pressure on the B.C. political landscape. When political leaders started getting involved in the conversation; resource industries listened. The attention from the media campaign created the opportunity to deploy the second building block. 2. The second building block involved getting all the relevant interests to the land planning table. Politicians, industry, social and environmental interests as well as small-scale economic stakeholders all sat down and negotiated a working management plan for conservation of the wilderness. Since the M-KMA Act was ratified in 1998, the operation and advocacy of ecotourism outfits, including a horseback safari outfit owned by Wayne Sawchuk, has shut out resource development. This is rare in a region as resource-rich as Northeastern British Columbia. Ecotourism outfits have created good jobs for local communities and economic incentives to grow the tourism sector throughout the region. Finally, First Nations have inhabited the region for thousands of years using the land traditionally for living, hunting and gathering. The M-KMA has enabled these activities to continue and preserved the First Nations' distinct cultural and spiritual beliefs and customs. In the summer of 2017, my mother and I accompanied Wayne Sawchuk into the M-KMA for a two week horseback trek from the Prophet River to the Tuchode Lakes basin. 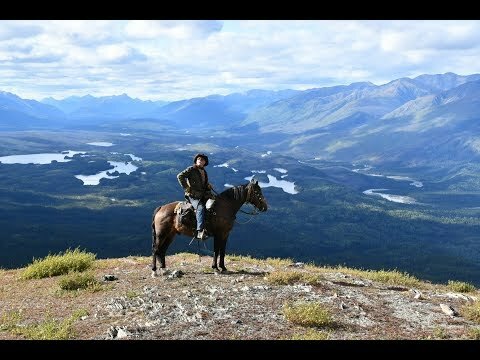 This experience changed my life, as we rode through some of the most intact and remote continental wilderness left on the planet. The biodiversity, cultural history and beauty of the region were staggering. We experienced herds of over 200 mountain caribou pass through camp, watched interior grizzlies in the dozens hunting moths on scree slopes, and much more. However, what really moved me was learning about the work and legacy of our guide, who has been largely responsible for protecting this region for decades. An ex-logger turned conservationist, Wayne spearheaded a movement in the 80's to protect the M-KMA from ever-encroaching resource development. This region is the size of Ireland and situated in the Northern Rockies, a pocket of British Columbia that is resource rich and has been booming with oil and mining operations for decades. Wayne's motivation was to protect one of the last true wildernesses of North America, so he initiated a land planning campaign to influence public policy and create a management area. It was a moving experience to ride across this landscape on horseback, leaving barely a trace, and be part of a working model where wilderness preservation and sustainable economic opportunities are in harmony. The management area has enabled ecotourism outfits like Wayne's to operate, and it is through their advocacy that resource licensing has been barred since the M-KMA's legal protection in 1998. I left the trip feeling alive and at peace knowing that there are still places on this planet that are truly wild. It is my hope that my grandchildren can say the same.